Some breeds are small enough to strategically wedge into an unreachable space before bath time. Larger breeds can clear a coffee table with the swipe of a tail. If you're looking for one in between, a handful of them are considered non-shedding breeds. There's really no such thing as a non-shedding dog, but some do shed lightly. On average, the weight class for medium breeds is 25 to 50 pounds; many terriers are midsize. 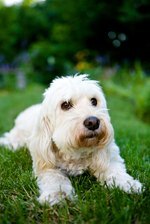 Among terrier breeds that shed lightly are the Scottish terrier, the West Highland, the Kerry blue, the wheaten, the Lakeland and the standard schnauzer. All of these breeds have playful personalities, easy natures and when raised with a family are good with children. However, they do require regular brushing or trips to the groomer. The basenji, also known as the barkless dog, doesn't require a groomer but does need an owner who can provide an active lifestyle. The Labradoodle varies in size and is bred to have the Labrador personality and the poodle intelligence and so-called nonshedding trait of the poodle. Their personality and intelligence blends beautifully. Whether or not this breed sheds, however, depends on which side of the gene pool prevails.